"On the first day of action, the police officers should stay in their offices and only respond to the emergency calls," the union said in a Facebook statement. According to the statement, the negotiations about the law enforcement budget for the upcoming year will be held at the National Assembly (lower house of the French parliament) on Thursday. The proposed budget envisages a 62-million-euro ($70 million) decrease in law enforcement financing, which, according to the statement, would become "another blow to our labor conditions." The labor union argues that the budget must take into account the plan to modernize the system, both in terms of providing accommodation and equipment, and calls on the lawmakers not to pass this budget. "Alliance Police Nationale labor union urged the lawmakers, who represent the people, not to vote for this budget," the statement read. 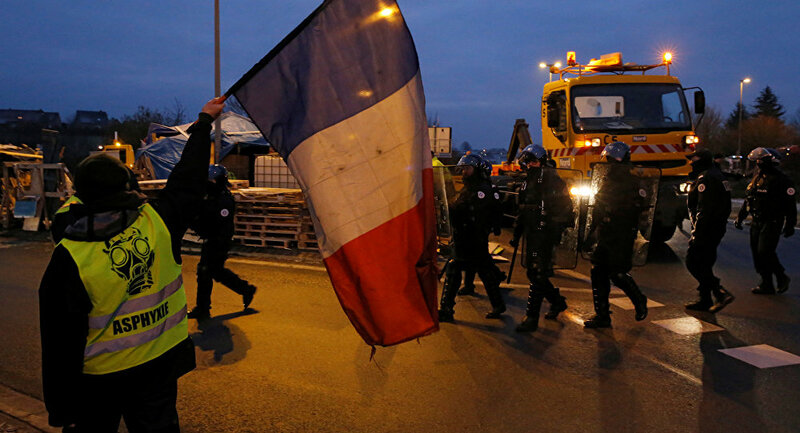 The French police strike will take place against the backdrop of the so-called yellow vests protests — named after the obligatory attribute of French drivers — that started in mid-November. The French government has scrapped its planned hike in diesel taxes that sparked the protests, but the yellow vests have since morphed into a broader movement against government policies and rising living costs. The rallies have been marked by violent clashes with police officers, who have used tear gas and rubber bullets against the protesters.